Today I’d like to begin a discussion on one of the most underappreciated elements which manifests itself in almost every game: death. More specifically, death of the player controlled character(s) as a result of gameplay and player decisions. Without this kind of death, the average game would feel like little more than a poorly written action movie. The kind with no tension due to the fact that you know the hero is going to make it out of every situation on top no matter how desperate things seem. Despite this importance, many of the titles I’ve played over the years simply failed to attach an adequate weight to players’ deaths. All too often, the result of dying is nothing more than a momentary setback which I struggle to even call an inconvenience for fear of overstatement. It’s a trend so severe that when I do come across a game where death has truly well-implemented weight to it, it stands out to such an extent that I’m inspired to write a series of articles on the matter (the first installment of which you are reading now). A good part of the reason for the chronic nature of this issue might very well be the seeming lack of discussion around death and death mechanics both when reviewing games and in general. To be fair, I did find a handful of articles and videos such as Making Death Matter while researching for this series, but they were generally either just a few thoughts and tips on the matter or little more than a list of games with interesting twists on death. Perhaps it’s discussed in professional courses and behind paywalls, but in general, there’s more or less a silence on the subject. 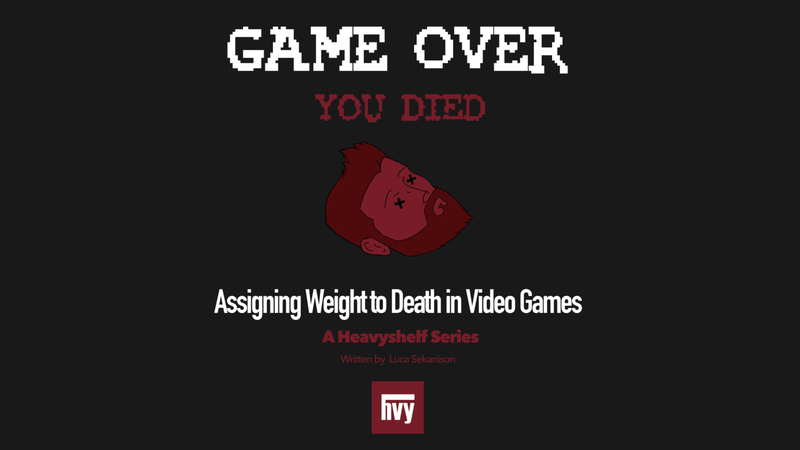 While I’d like to make it clear that I’m a player of games rather than a developer (and thus lack the ideal expertise), my goal with this series is to address that vacuum of truly comprehensive discussion on the topic of assigning weight to death in games. Over the course of this series, I will try to address as many aspects of the subject as I can. For this first installment, I’m simply going to provide a foundation for the upcoming articles. Before I continue with the series, I think it’s pertinent for me to more clearly describe the problem that I perceive so many games as having when it comes to implementing death and why it’s an important one. Like previously mentioned, the issue, simply put, is that a lot of games fail to assign adequate weight to death. What do I mean by weight? Well, more or less the impact that the death of the player controlled character(s) has on the player. That certain little level of panic that the player should ideally feel when their health is getting a touch too close to zero. That tension they feel when they’re in a difficult fight, and really don’t know if they’ll prevail. More than anything I mean that little bit of punch the player should feel when their character dies. All too often games don’t really provide satisfactory weight for dying because it isn’t really that big of a deal. In far too many games we are merely sent back to the last save or checkpoint with no further effect or consequence on the character, world, or player experience. While that respawn-only method can be a fine way of doing things for some games, I would argue that it’s far too widespread and has become a dull trope that’s been around just about as long as video games themselves. As a result, in many instances, this kind of death feels like a lackluster substitute for a more complex and/or thought out death mechanic. Ultimately, in games where having to respawn from a save or checkpoint is the sole consequence of death, nothing is lost beyond a few moments. As a result, dying often feels like little more than a slap on the player’s wrist. I’m sure that on the surface that might sound like a good thing. You might think that a game shouldn’t be too harsh with the player and that letting them off easy will make the game less stressful and more fun. While there is some truth to that, you have to consider the role of the player character(s) death in a game. Not so much scripted death in the story of a game, but rather the death that comes from gameplay and player action; essentially, from player failure. You see that’s what death from gameplay generally is: a manifestation of the player’s failure. While that may sound negative, the reality is that death in games gives us something to defy as we strive for progress and success in a game. While not always the case, the thing that makes a lot of games worth playing is that ability to survive or not, to do well or poorly, to succeed or fail. As I said before, without death, the average game feels like a bad action movie, and so when the consequences of dying are so mute as to not provide much weight, we slip real close to being like a lesser known Schwarzenegger film. When you look at it in these terms, you start to understand how implementing death without giving it the right weight can take the flavor and appeal out of a game. Don’t get me wrong; I don’t think the issue of ill weighted and bland death has arisen merely due to simple laziness on the part of developers. There’s a lot of obstacles and pitfalls when trying to implement death well in a game. Thus far I have identified three main challenges when it comes to assigning the right kind and level of weight to death. The first major obstacle is identifying exactly what level of weight a given game needs along with what methods for giving it that weight will best complement the game. In my estimation, how impactful an individual death can/should be as well as what methods can reasonably be employed to add weight depends largely on what kind of game is being made. More casual games don’t need the same sort of weight on death that more serious ones do. Similarly, things like multiplayer competitive games (let’s say Overwatch) generally don’t require there to be much beyond a waiting time to respawn (not even that in the case of things like fighting games) since that wait in and of itself can be a big deal for winning or losing. Things like RPGs and survival horror games, on the other hand, might require something a bit more complex steps to give death its appropriate weight. The way I see it, it’s important for the maker of a game to recognize what weight needs to be assigned and how. The second major challenge is striking the right balance when giving death its due weight so you don’t make it a turn off for players. The best of the videos I came across while doing research for this series put it very eloquently (speaking in the context of horror games): you have to “ensure that the player views death in the game as something more frightening than frustrating.” If a game makes death have too many negative consequences, it runs the risk of having players decide that progressing through the game isn’t worth the trouble and ultimately quitting or just not buying the game in the first place. I think it’s fear of this outcome (perhaps in combination with lack of ambition or vision) that drives a lot of games to simply choose a “just respawn from last save or checkpoint and nothing else” consequence for dying. The issue of playing it safe like that is that it can often be a kind of preemptive over-correction which makes the game bland or tensionless like I discussed earlier. One of the foremost examples of how going down the “just respawn” route can make a game too relaxed and boring is Fallout 4 (along with some of Bethesda’s other titles). It’s a game where (bar survival mode) you can save at any time (meaning JUST before getting in any fight or making any decision) and just re-load with no consequence if you die or things don’t go perfectly. As a result, I think that anyone who’s played it for a while can agree that, while it’s far from the games biggest issue, Fallout 4 isn’t capable of evoking much tension. Deciding how the player character(s) come back from death is the last of the considerable challenges I’ve identified. The game has to find a way to mesh death and its theoretical permanence with a format where it inherently loses that permanence. This is especially true for games where you respawn (otherwise known as the majority). How one chooses to do that can be crucial. For example, games that decide to just have a rewind time and that nothing you did since the last checkpoint counts kind of approach creates a situation where it’s difficult to justify a player’s death affecting the world of the game (one of the methods by which weight can be added to death). On the other hand, games that provide an explanation, like regeneration or cloning, risk limiting where the story can go without leaving holes (for instance it can become difficult to kill off characters as part of a narrative). It can also make death feel trivial even when thinking inside the context of the world of the game. Despite being an excellent game, Bioshock is an example of a game which strongly displays the latter problem with its Vita-Chambers. It’s vital that we remember these three as we continue through this series since any suggested or praised method for assigning good weight to death will need to be judged in relation to these challenges. Ideally, this first article should provide a good springboard for the rest of this series. Hopefully, you have a good understanding of the kind of death I’m talking about in games as well as what I mean by assigning weight to it. You should also have a good idea of the issue that spurred me to start writing these articles. In the next installment, I plan to cover why we use death as the manifestation of failure in games, what we can learn from that, and some ideas on how to apply that learning. For those interested, that installment is scheduled to come out next Wednesday (January 23, 2019). Editor’s note: Assigning Weight to Death in Games, Pt. 2: Learning from Death is now available!